Well I went to my Mom and Dad's the other day and totally forgot to get my prom picture from her. 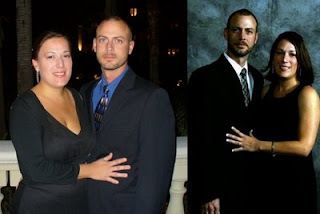 So here are two photos of me and hubby. Both are taken at the Pennacle awards for my hubby's company. The first picture I was probably a good 20 lbs more than what I weigh now. It was taken November of 2007 while on vacation in California, which was the same year as the Fetal Death and my Best Friend passing away so hence the weight. The second was taken February 2009 while we were on vacation in the Bahamas. In both photos, you are one hot lady!! I am sorry to hear that you had such a rough year in 2007. Glad you got to join in! I really think that they are both beautiful pictures! we are always our own worst critic (well with the exception of our moms now and then) hehe, you are gorgeous in BOTH photos! you look great, jenny. really. '07 was rough for me too and i'm trying to lose that 20 lbs i gained because of it as well. so sorry that year was so hard on you, but i think both pix look beautiful. I LOVE the dress in your first picture. You look beautiful in both of the pictures. : ) Congratulations on losing 20 pounds. I would like to lose 20 pounds. Times 10 : ).